I spent two weeks in the UK, meeting researchers studying crowdsourcing and volunteering in arts, humanities and geographic projects. The reason for travel is my own study that is closely knitted to the Wikimaps project. There have been several attempts to categorize activities taking place in this area. Terms like crowdsourcing, user-generated content, citizen science, VGI (volunteered geographic information) or even citizen history have overlapping meanings. Categories have been proposed based on levels of participation or type of task to be carried out. Overviews of recent developments in crowdsourcing the archive in the arts and humanities are being crafted by academics. Stuart Dunn (blog) and Mark Hedges from King’s College, London, have made a survey, workshops and a report Crowd-Sourcing Scoping Study : Engaging the Crowd with Humanities Research. Kathryn Eccles (blog) is a researcher in Oxford Internet Institute, mapping the area broadly. She has focused on the Your Paintings Tagger project, that invites users to classify paintings in the UK. The video recordings from last year’s one-day workshop Digital Impacts : Crowdsourcing in Arts and Humanities she organized at the OII can be found online. Mia Ridge (blog) is preparing her PhD and publishing a book Crowdsourcing our Cultural Heritage this year. One of the tasks that lends itself best to crowdsourcing is transcribing. I familiarized with two projects. 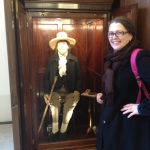 Tim Causer and Kris Grint discussed the Transcribe Bentham project at University College of London, a project that provides thorough reading and analysis of Jeremy Bentham’s works. I had my photo taken in front of the mummified Mr. Bentham, which, I was told, is a favourite souvenir on graduation day. A sort of museum selfie – they call it auto-icon… Technologically, the project is building an extension in MediaWiki to handle the transcription process. Zooniverse, an Oxford-based academic project, runs popular citizen science projects. Amateurs have been invited to identify galaxies, cyclones or species on land and sea. 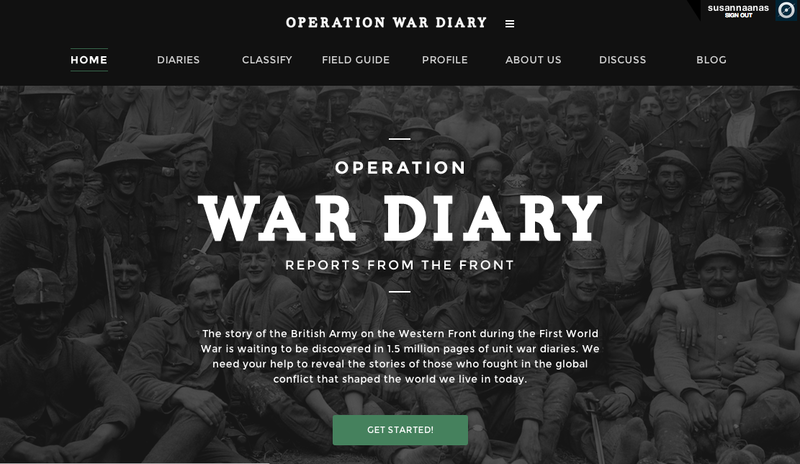 Rob Simpson (blog) presented the latest project Operation War Diary, a collaboration with the National Archives and the Imperial War Museum’s Lives of the First World War to transcribe WWI war diaries. Instead of trying to transcribe every word of the life in trenches, the project aims to index the diaries, listing names, places and activities. Kate Lindsay, Ylva Berglund Prytz and Alun Edwards at Academic IT, University of Oxford have also been working with the memorabilia of WWI. They have studied community collection methods in the Europeana 1914–18 project. Road show collection days have been arranged around Europe to enable face-to-face encounters between those who have stories or objects of the war and the researchers. Volunteering with geographic information can take many forms, extending beyond participating in OpenStreetMap, the map that anyone can edit. Muki Haklay (blog) leads the Extreme Citizen Science (ExCiteS) research group at University College of London. Projects are exciting: Participatory mapping in Congo-Brazzaville, Material practices of participatory sensing, Tools for Conservation Volunteers, Engagement in publicly initiated scientific research, ICT helping arctic hunters to adapt to climate change, Mapping tools for health services, to name some. If you have the time, there will be a seminar soon. Citizen Cyberscience Summit will be held in London on 20-22 February 2014. UCL is a partner in Mapping for Change. It is a social enterprise that uses online mapping and GIS to support sustainable communities. Under the supervision of Louise Francis, they have worked with several community mapping projects. The projects attempt to facilitate in situations of environmental change, by addressing the communities affected by the changes. There is an emerging field of projects using collaborative sensing. Mappers are recording their movements in space and time and gathering additional information about themselves or the environment to contribute that information to the project. Christian Nold (website) has explored emotional mapping in his participatory art works. Biomapping is a methodology to measure and visualize the emotional response of people in relation to their geographical location. 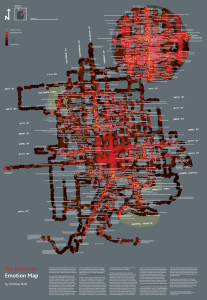 San Francisco Emotion Map shown here involved a total of 98 participants exploring San Francisco’s Mission District neighborhood using the Bio Mapping device, echoing the situationist dérive drifting through urban spaces and a psychogeographical enquiry into the perception of space. I also had the opportunity to chat with Yuwei Lin (blog), who has studied hacker cultures and gender bias in OpenStreetMap. She was introducing OpenStreetMap at Victoria & Albert Museum Digital Futures event, a showcase for emerging artistic practices. Mark Graham (blog) said that geography is all and nothing: It either includes everything or is included in everything. He is the Director of Research at the Oxford Internet Institute, and he has a special focus on Information Geographies, of how people and places are manifested through their virtual representations. Maps studying the extents of the knowledge sphere of the Internet have been crafted in collaboration with Stefano De Sabbata. One of the researchers in the project is Heather Ford (blog). She is a former Advisory Board member in the Wikimedia Foundation, and she has worked as a digital ethnographer in the Ushahidi project. Here is a writing reflecting patterns of conflict and vandalism on Wikipedia: How Wikipedia’s Dr Jekyll became Mr Hyde: Vandalism, sock puppetry and the curious case of Wikipedia’s decline. It is an interesting time in history to be working with these topics. The aspirations, opportunities and experiences are accumulating and creating an opening for a participatory commons, as phrased by Mia Ridge in the poster Creating a Digital History Commons through crowdsourcing and participant digitisation. Eric Meyer, Ralph Schroeder, Isis Hjorth, Ulrike Rauer, Johanna Sumuvuori, Juhani Yli-Vakkuri, Claudio Calvino, Vili Lehdonvirta, Khairunnisa Haji Ibrahim, Antti Halonen, Melissa Terras, Gianfranco Gliozzo and Jessica Wardlaw. This entry was posted in Documentation on 1 February 2014 by Susanna Ånäs.